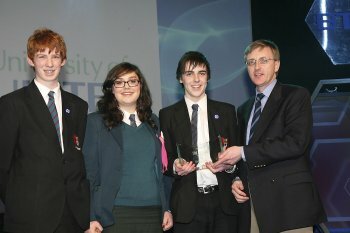 The University of Ulster’s inaugural award for Northern Ireland schools at the BT Young Scientist & Technology Exhibition 2011 in Dublin has gone to a novel project by Banbridge Academy pupils investigating the environmental impact of toilet tissue. ‘Luxury or Bog Standard ? The Environmental Impact of Your Loo Roll Choices’determined how environmentally friendly different types of toilet roll are by investigating the amount of glucose produced when different ‘loo-rolls’ are digested by enzyme cellulose. The project, which was developed by students William Clackett, Neil Cunningham and Romy Gerring, was entered in the Intermediate section of the Biological and Ecological category, Intermediate section. The announcement was made by Dr Paul Hanna Head of School of Computing and Mathematics at the awards ceremony held at the RDS in Dublin. Congratulating the students on their successful project, Dr Hanna said the University of Ulster was delighted to be associated with such a successful event. “Congratulations to everyone who made it through to the final stages of the competition and got to present their work in Dublin but in particular, the winners of the University of Ulster’s special award, Banbridge Academy. “The BT Young Scientist is clearly very successful in sparking enthusiasm for the broad discipline of science among our young people and this is something which is vital for our future. It was tremendously encouraging to see the breadth of young talent on show and to see how their enthusiasm for technology was contagious to the general public visiting the exhibition,” said Dr Hanna. “Congratulations to the team from Banbridge Academy and all to the winners - their work is inspirational and deserves to be showcased through a world-leading event like the BT Young Scientist & Technology Exhibition. I look forward to watching their progress in the coming years,” he added. This is the first year that the University of Ulster has sponsored the Northern Ireland Award and the partnership reflects the university’s focus on engaging with schools and colleges to raise awareness of the diversity and attractiveness of careers in computing and engineering. Dr Paul Hanna, Head of School of Computing and Mathematics,University of Ulster (far right) with award winning Banbridge Academy students William Clackett, Romy Gerring and Neil Cunningham.